I have been toying with the idea of doing a horizontally-striped crochet scarf for a while now. What has kept me from it is the idea of weaving in ALL those ends… one of my least favorite tasks! But when I fell in love with a rugby-style knit scarf at the store a while back, I knew I needed to try it, just to see if it really would be as much of a pain as I envisioned. I had my then-16 year old sis Jenny (above) in mind when I picked out the yarn for my first rugby scarf. I chose Hobby Lobby’s “I Love This Yarn” (my favorite yarn!) in a light grey and white. She’s not one for boring accessories, so I took a chance and switched the plain white yarn for White Sparkle (same brand). 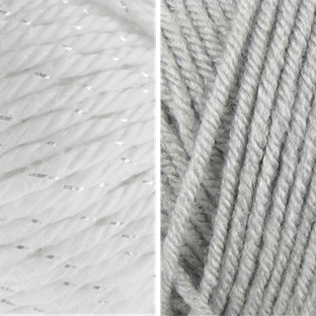 It’s basically white yarn with one strand of shiny silver running through it. This was the first time I’ve used a sparkle yarn, as I think it can become gaudy looking very quick. But I was pretty confident that this style of scarf and amount of “sparkle” would work perfectly to produce a classy, unique accessory. Once I had my yarn, I got to work. I started with a chainless foundation of 22 double crochet stitches, but you could also just start with a regular chain. The basic idea is that each segment of color is 7 rows of 22 DC. I ended up with 14 segments total (7 grey, 7 white sparkle), and a great length for a double-wrap infinity scarf. I whip-stitched the ends together; then I got comfy on the couch with my yarn needle and scissors and spent a while weaving in those 28 ends. Not my idea of fun, but it was WORTH IT for the finished product! The photos don’t really show the sparkle on the white segments, but trust me, it’s there. I LOVE how it turned out. In fact I was so in love with it that I seriously debated keeping it for myself, and probably would have if Christmas wasn’t just right around the corner and I hadn’t been so behind on Christmas presents already! 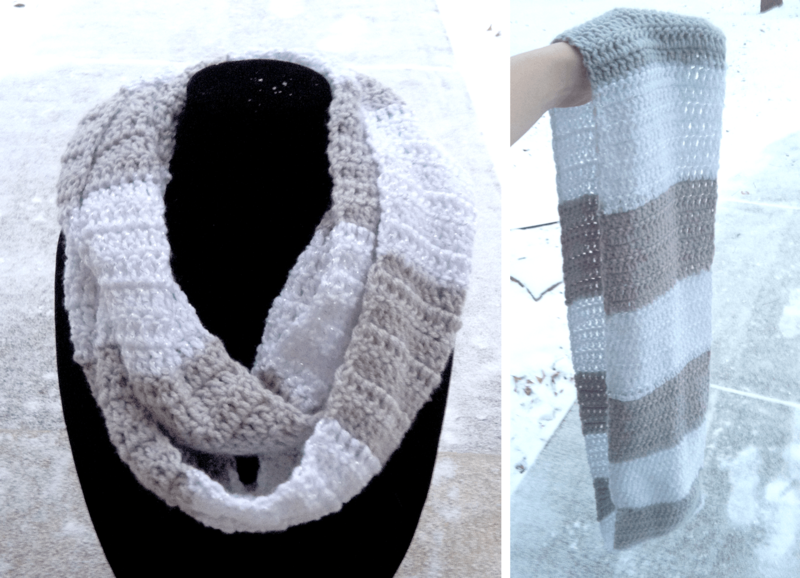 This scarf is also part of an e-book of 8 infinity scarf patterns by Yours Truly. These are inexpensive ad-free pdf versions of my patterns. Click here to check it out! 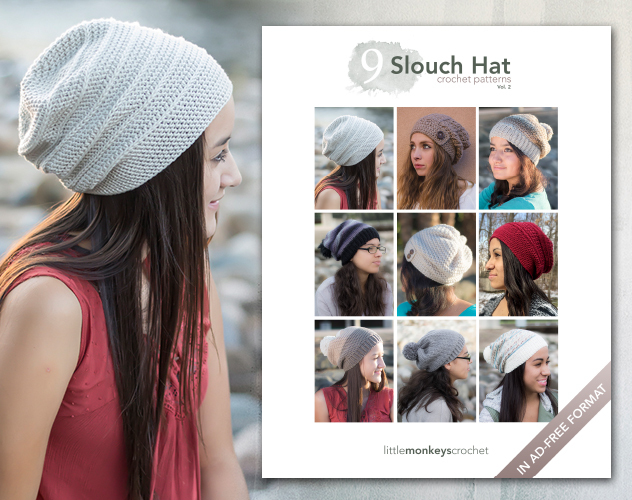 Click here to purchase the "8 Infinity Scarf Crochet Patterns" E-Book! Note: Ch 2 does NOT count as starting DC. Switch to Color B. Cut yarn from Color A, leaving about a 6" tail. Switch to color A. Cut yarn from Color B, leaving about a 6" tail. Repeat this process section by section, 22 DC per row, 7 rows per section, until you have 14 total sections (98 rows), or until the scarf is the length you want it. Cut the last tail of yarn, leaving about 12" tail. Use tail to Whip Stitch one end of the scarf to the other. Fasten off. Weave in all those ends, and you're done. 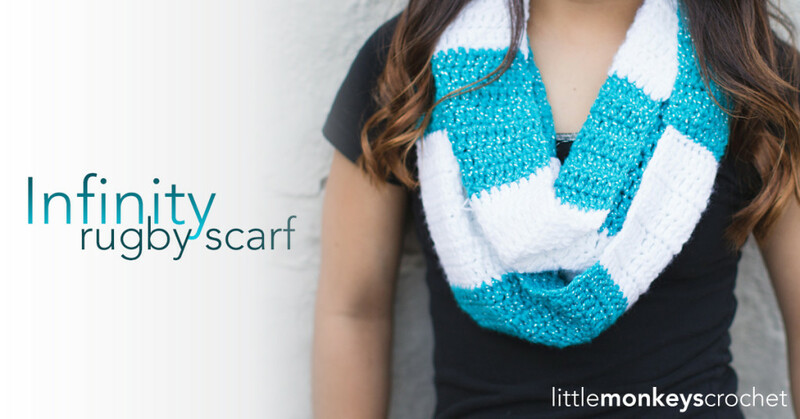 Enjoy your new Infinity Rugby Scarf! Thanks for the link Sarah! I do use that method for some of my projects, but I tend to be a little paranoid about the ends coming loose, especially on items I am selling or giving away. It is a very handy technique though! Hi Rebecca! I just found your blog a couple weeks ago and LOVE your patterns and shop! I’ve made 2 of your other scarves and can’t wait to get started on this one! I love this scarf. Can’t wait to try it out. Can you tell me how many skeins of each color you used? I’m so excited to try this scarf 🙂 being a little new I had some questions. Counting the finished dc in each row I have 23 for the fist row 22 for the second and following rows. Is this correct? Ty lol I thought it merited a question…maybe what I’m thinking is 3rd ch is actually only 2nd? I’m mostly curious as to how it magically disappears, but as long as I have nothing to fear 🙂 I’m using Lion Brand VC grey marble, brick red, and thinking about tossing in a few short accent lines of charcoal. So excited to see how the colors turn out!! I would just count every so often and make sure you still have 22 per row. When you get to the end and you are sewing the ends of the scarf together (if you choose to make it an infinity scarf), you may have to stitch 1 stitch from the last row to two stitches from that row of 23 to make up the difference. Are you doing a normal double crochet? When I do 7 rows I feel like it is much thinner than your picture. The band’s of mine are much thinner also. I have 7 of both colors and it’s not long enough for a plain scarf. But I tend to stitch tightly maybe that’s the issue. I wondered what the finished length was before whip stitching. Have you ever done this double strand? I wonder what it would look like two-toned, but worried that two strands might make it too thick and not give it the right drape…what do you think? I haven’t! The way this scarf is worked up though, building the length as you go, makes it a good candidate for experimenting. If you do a couple of sections and realize it’s not working out, at least you haven’t put too much time into it! 🙂 It could work, but I would definitely use a larger hook, and perhaps even 2 strands of DK instead of worsted yarn. Good luck and let me know how it turns out if you try it! 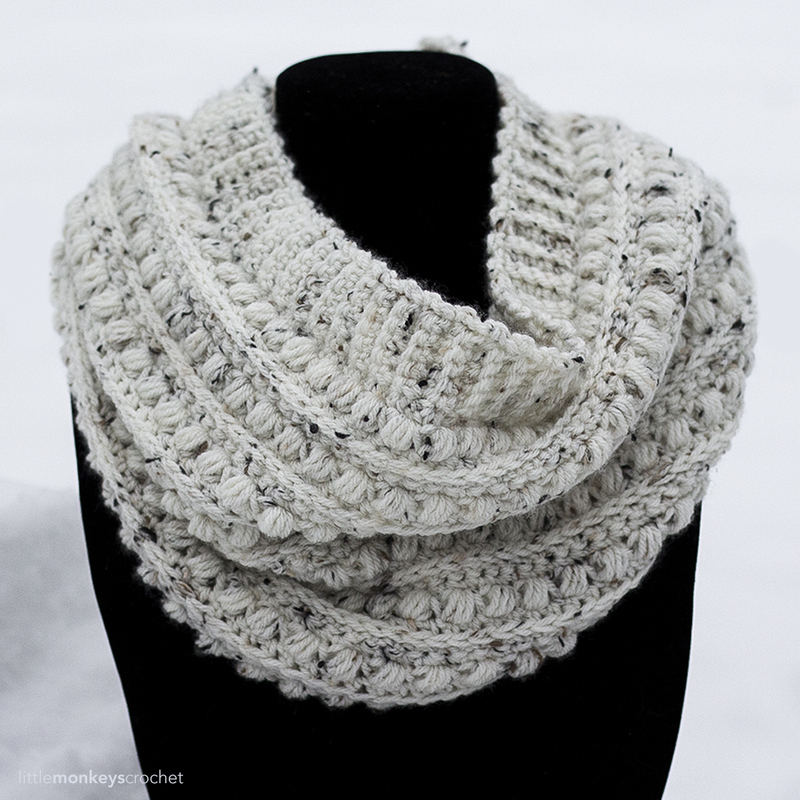 The sparkle yarn is perfect for a scarf. The photos you’ve shared are beautiful and so elegant. It would be perfect for your outfit, especially for a party. Thanks Betty! 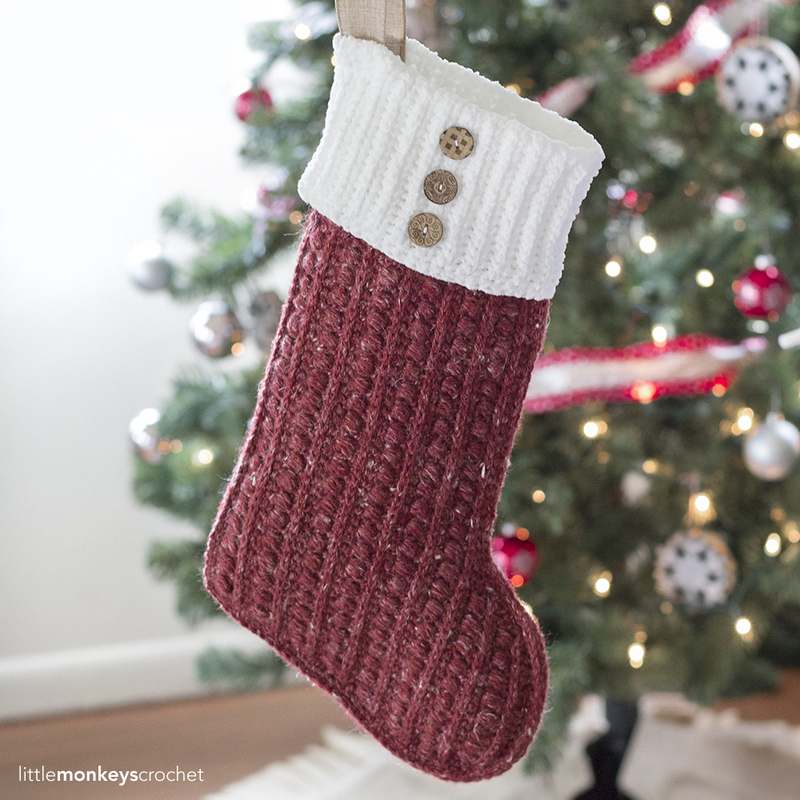 I think the sparkle yarn adds a nice touch. You’re right, it would be great for a party! Do you know how wide your adorable scarf is…I want to make this out of DK yarn for fall and trying to figure out how many starting stitches I’ll need. The edges of my scarf look uneven. Do you know why I would be having this problem? Hi Courtney! I’ve been asked a lot how I get my straight edges. My trick is that when I Ch2 at the beginning of a new row, I make my first DC in the NEXT stitch. Then at the end of the row, when it seems like I’m out of stitches but need to make one more, I make it in the Ch 2 knot from the previous row. This technique provides a nice straight edge. As long as you’re following that tip, and getting 22 from each row, it should come out nice and straight. I tried looking it up but couldn’t find on you tube, how to fasten off after a whip stitch? Can you help me? I usually just tie a knot and weave in the ends. I am currently making this scarf, and I think my stitches are tighter than yours, so the 14 sections aren’t long enough for an infinity scarf. About how long was your scarf before you fastened the ends together? hi, how much yarn did you use? About how long would you say the scarf came out to be? I have downloaded PDF but don’t know how to copy a pattern. Please help. I’m not sure what it is that you’re asking. Did you create a pdf with the “print” button? I’m Definitely going to make one for my granddaughter and daughter. Maybe for me too. 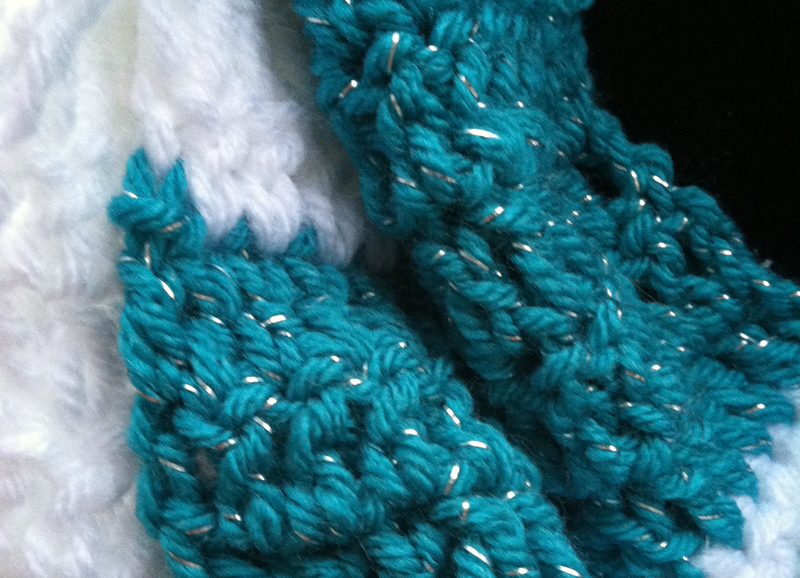 I love the teal and white one but the other scarf is Pretty too. . I live in OSU country scarlet and grey would be neat too. Just finish the scraf, turn out great. It took two days. 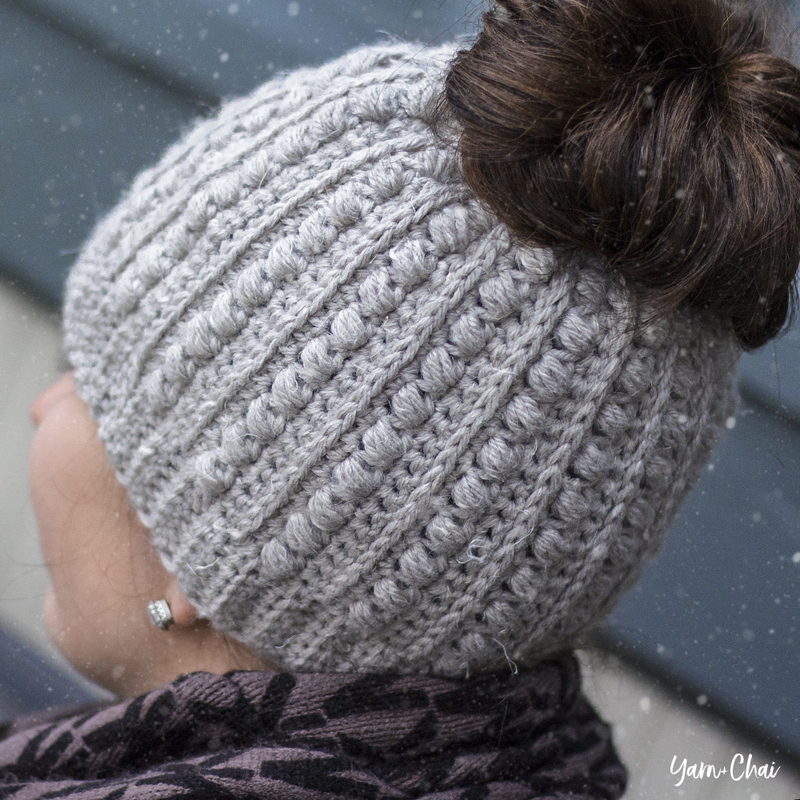 Do you have a pattern for a matching hat with a pom pom on it. i really think this is beautiful.i want to make one for myself.can i please have the link? The pattern is adorable, but the constant script warning makes it impossible to read. Can you please resist the temptation to play with the newest web toy and just print instructions that we can read? I’m sorry you’re having trouble. There is no script warning on my website. If you are having trouble, it could be a problem with your browser or security software. There is also a “print” button located just above the pattern, or you’re welcome to copy & paste for personal use. I love, love this scarf. Can’t wait to get my yarn for it. Thank you for your fun, easy patterns! I am fairly new to crochet so I appreciate the beautiful patterns you have! I look forward to following you in the future. I love the variations of this pattern. ? Scarves are the only thing that keeps me warm at work! 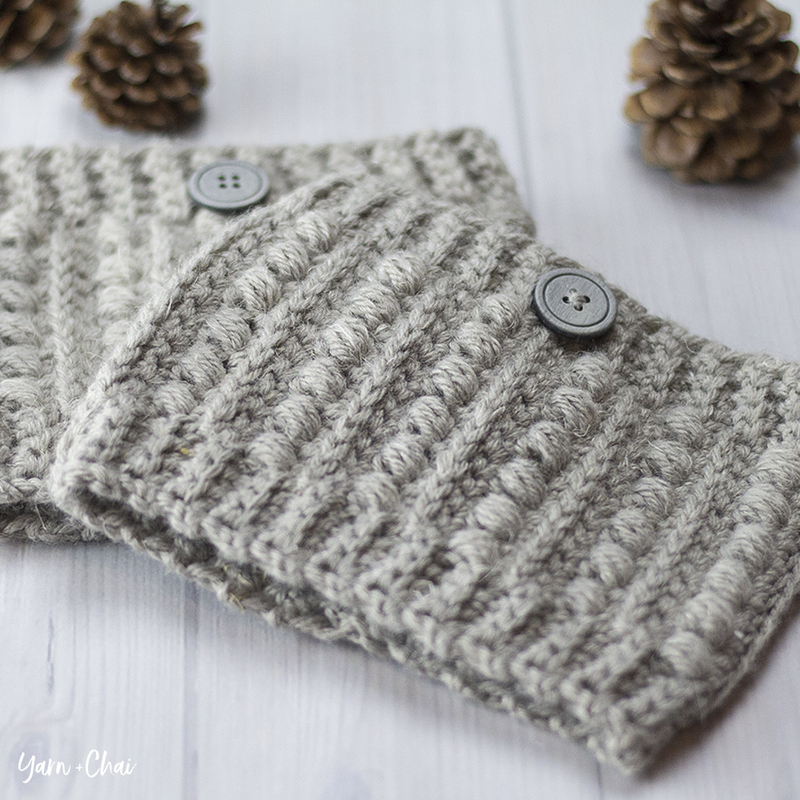 I love the double loop feature of this infinity scarf! Love the look of this one, can’t wait to try it out! ? Wish I had read your comments before starting this project. H hook made my stitches too rigid. Wish I had used an N hook, like you suggested! Don’t like the look of feel of mine. Hi there. I love your yarn choice, can’t wait to try this pattern. I may not be able to use the exact same yarn, so are you able to provide the approximate dimensions of your scarf? Maybe the width of the 22 stitches and the height of each chunk of color? Your ratio looks perfect! I’m just wondering if your default is to work through both loops or just the back loop anytime you do a crochet project. I always go through just the back loop (the one farthest from me, is that the front or back!? ), unless the pattern says otherwise, because that’s how I learned. But I’ve come to realize that this creates a different look and perhaps most pattens are written intending for the crocheter to go through both loops. Please advise! Thank you! Hello! Always work in both loops unless the pattern specifies Front Loop Only (FLO) or Back Loop Only (BLO). I believe crocheting into the back loop only was standard many, many years ago, so depending on who taught you (and who taught them), that might be why you learned that way. 🙂 But nowadays, both loops are standard.